Countless books have been written about the process of healing the brain from traumatic situations. 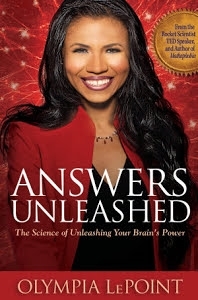 But Answers Unleashed: The Science of Unleashing Your Brain’s Power by Olympia LePoint is the first self-help neuroscience book written by an award-winning rocket scientist who overcame her own life challenges to launch 28 NASA Space Shuttle missions into Space. Scientist Olympia LePoint defines a new structure of the brain, called the Triabrain and the Triabrain Theory of Relativity, which profoundly describes how anyone can reshape their brain and ultimately transform his life. Answers Unleashed takes a step forward in neuroscience as a new field of study with self-directed neuroplasticity. It’s a fresh, innovative work that is unique in neuroscience. Olympia LePoint shows how to overcome difficult situations and gain success by calling forth the brain’s processing power. In Answers Unleashed, Olympia LePoint delivers infectious brain-shifting energy which explodes through people’s real life stories. Olympia LePoint describes the profound Triabrain science in easy-to-understand terms for everyone to enjoy. Simply take this neuroscience textbook home for a university education in the privacy of your own home. With the science that she used to map space vehicles to Mars and distant planets, Olympia LePoint now applies the same science to the human brain, so people can remap their brain’s interior by using thoughts. Answers Unleashed introduces the Triabrain Theory of Relativity which indicates a new side of the brain coined the “faith sector.” In addition to the brain's left and right hemispheres, the faith sector introduces the understanding of intuition, and it’s assistance in decision-making abilities. Modeled from Einstein’s Theory of Relativity, the Triabrain Theory of Relativity approach combines faith, science and intuition as a new combination in brain science. Readers explore the ideal function of the Triabrain, learn the mathematical structure of chaos, and understand how life chaos separates the brain into struggling sectors called brainbrink. As seen in recent studies of deceased NFL players' injured brains, brainbrink serves to create emotionally-charged dark brain masses that stall the brain’s reshaping and healing capacity. Everyone has brainbrink. Any emotionally or physically charged, chaotic situation can produce these masses in the brain. However, rocket scientist Olympia LePoint shows how to reverse brainbrink by taking chaos and using it to your advantage. Endorsed retired NASA astronaut Robert Curbeam and by world-renown neuroscience researcher and best-selling author Jeffrey Schwartz M.D, Olympia LePoint explains how a person can turn back on their sensory motor cortex and their executive thoughts for innovation. 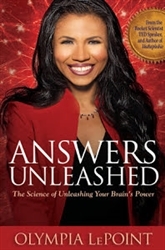 Answers Unleashed provides the recipe to jump-start the brain with a unique combination of faith, intuition, psychology and science. This ground-breaking Triabrain Theory of Relativity, serves to reconnect the prefrontal cortex and striatum together for mental awareness. LePoint innovatively defines a new branch of neuroscience. Through her Triabrain Theory of Relativity’s mathematical introduction of fractal moments, Olympia LePoint explains mathematically how decision-making has a role in reshaping the brain. With this approach, readers unleash their intuitive abilities, birth great ideas into scientific innovation, and change the course of their lives by attracting lucrative success. You can become a genius at any age! If you are a person who wants to unleash your brain’s true powers, or redirect your thoughts in unleashing your answers, this book is designed for you. Buy or download copies today!